BOSTON - Former President George H.W. Bush was honored Sunday with a Kennedy "courage" award for agreeing to raise taxes to confront a spiraling deficit, jeopardizing his presidency that ended after just one term. The award crossed generations and political parties. It was given by Jack Schlossberg, son of the late Democratic president's daughter, Caroline Kennedy, to Lauren Bush, granddaughter of the former Republican president. The budget deal enacted "responsible and desperately needed reforms" at the expense of Bush's popularity and his chances for re-election, Schlossberg said. "America's gain was President Bush's loss, and his decision to put country above party and political prospects makes him an example of a modern profile in courage that is all too rare," he said. In a message read by his granddaughter, Bush expressed regret he could not accept the award in person. He blamed his absence on "a nasty rumor" that the evening's awards dinner would include broccoli - a vegetable the 41st president famously dislikes. 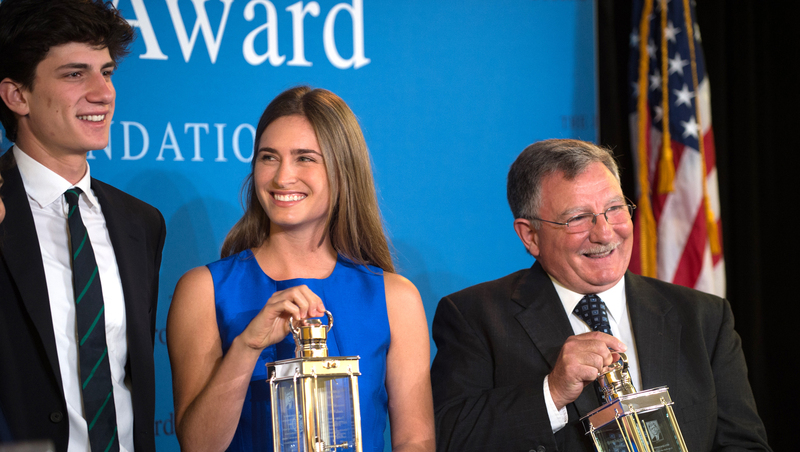 "Candidly speaking, my grandfather didn't want to raise taxes," Lauren Bush said as she accepted the award. "But ... he felt he owed the American people action and results. Compromise is a dirty word in Washington today. ... But once we get back to realizing the importance of actual governance, I suspect this too will pass." Also honored with a Profile in Courage Award was Paul W. Bridges, former mayor of Uvalda, Ga., who was voted out of office after he spoke out against a law that aimed to drive undocumented immigrants out of the state. Bridges, a Republican elected in 2009, argued that the law would separate families and harm the local agricultural economy. The award is named for Kennedy's 1957 book, "Profiles in Courage," which tells the stories of eight U.S. senators who took unpopular stands.